AMMAN — Eight community-based organisations (CBOs) on Tuesday received grants worth $350,000 to implement pilot projects enhancing the role of local communities and users of natural resources in addressing environmental issues. The pilot projects are to be sponsored by the Global Environment Fund and supported by the United Nations Development Programme (UNDP), which signed the grant agreements with the eight CBOs. 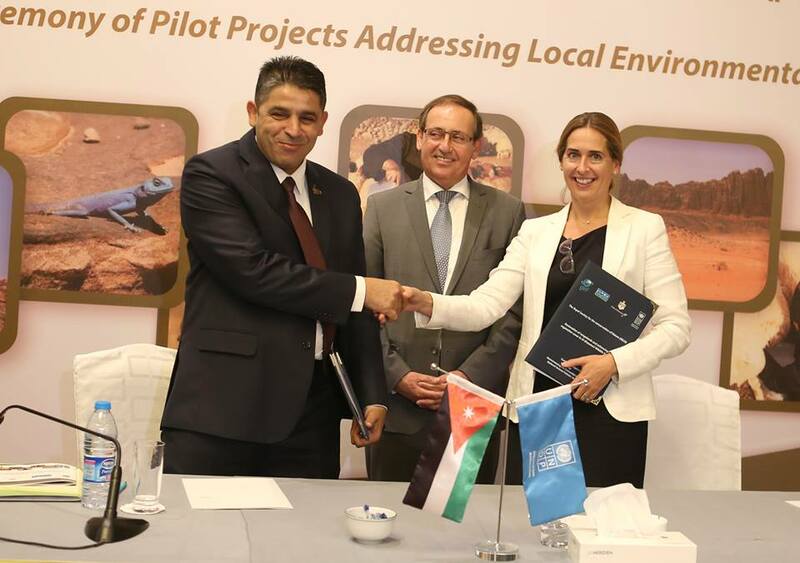 The grants were distributed to employ the environmental pilot projects under the Mainstreaming Rio Convention Provisions into the National Sectoral Policies in Jordan, which aims at including the provisions and principles of the Rio conventions into the national development policies and processes. The Rio convention refers to three legally binding agreements which resulted from the 1992 Earth Summit in Rio de Janeiro in Brazil: the Convention on Biological Diversity, the Framework Convention on Climate Change (UNFCCC) and the United Nations Convention to Combat Desertification, according to web sources. The Mainstreaming Rio Convention Provisions into National Sectoral Policies in Jordan is expected to enhance the National Rangelands Strategy and the National Drought Management Plan through introducing wise management principles and practices embedded in Rio conventions, according to organisers of the event, during which the agreements were signed between the UNDP and the CBOs. UNDP Jordan Country Director Sara Ferrer Olivella said that the CBOs implementing the pilot projects will “work hard” to meet the national obligations towards the Rio conventions, indicating that honouring these obligations is not only the responsibility of the government represented by the Ministry of Environment, but also of all the institutions, including UN agencies, NGOs and CBOs. socioeconomic development activities…,” she said, noting that the grants will also play a significant role in empowering women, particularly those living in rural areas. She underlined the role of UNDP’s Jordan office in supporting the government in implementing its obligations towards the international environmental conventions. Minister of Environment Yaseen Khayyat indicated that environment societies in Jordan play a major role in protecting the natural environment, noting that there are over 100 registered environment societies in Jordan. While 30 to 40 environment societies are actually regarded as active in the field of environment protection, Khayyat underscored that the ministry seeks to reach out to the rest of them and assist them in delivering their messages. “Protecting the environment needs the involvement of all community stakeholders to establish a clean environment,” Khayyat said. The minister also said he was pleased that two of the CBOs which received grants on Tuesday are women societies led by women. The pilot projects entail the reproduction of Al Ghaddah tree in Wadi Rum protected area, sustainability of natural plants and medicinal herbs in the badia of Maan Governorate and a project to provide irrigation water for home-grown fruits and vegetables through the use of water-saving technologies in Zarqa Governorate. The projects also include the restoration of rangelands and the enhancement of the vegetation cover in the Shoumari Nature Reserve in Azraq, Zarqa Governorate, a project for building the capacity of journalists to cover environmental issues, another for supporting traditional transhumance practices to reduce pressure of winter grazing on natural resources in Humret Maeen in Madaba Governorate, a project for improving water harvestion and soil properties in Balqa Governorate and finally a community-based rangeland rehabilitation project.